AIB is a financial services group operating predominantly in the Republic of Ireland and the UK. It provides a comprehensive range of services to personal, business and corporate customers in its target markets and have leading market shares in banking products in the Republic of Ireland. In recent years AIB has been dealing with an increased amount of payments that were taken by card over the phone and has expanded its call center based staff. AIB needed a secure and user friendly solution for the taking of card payments over the phone that put customer security, PCI DSS Compliance and removal of risk at the forefront of its operations. The Syntec CardEasy solution offered AIB the best possible fit when AIB was weighing up potential solutions. Syntec offered AIB an efficient, easy to use product that removed all records of card details from its call center, including call recording, thus increasing customer security and reducing risk. AIB chose Syntec’s hybrid on-premise CardEasy solution which works seamlessly with its existing SIP telephony provider and its chosen Payment Services Providers. The full card details of the customer do not enter and are not stored on any of AIB’s systems. No need to transfer the call to an IVR for payment to be taken, this allows AIB to build a stronger relationship with the customer. 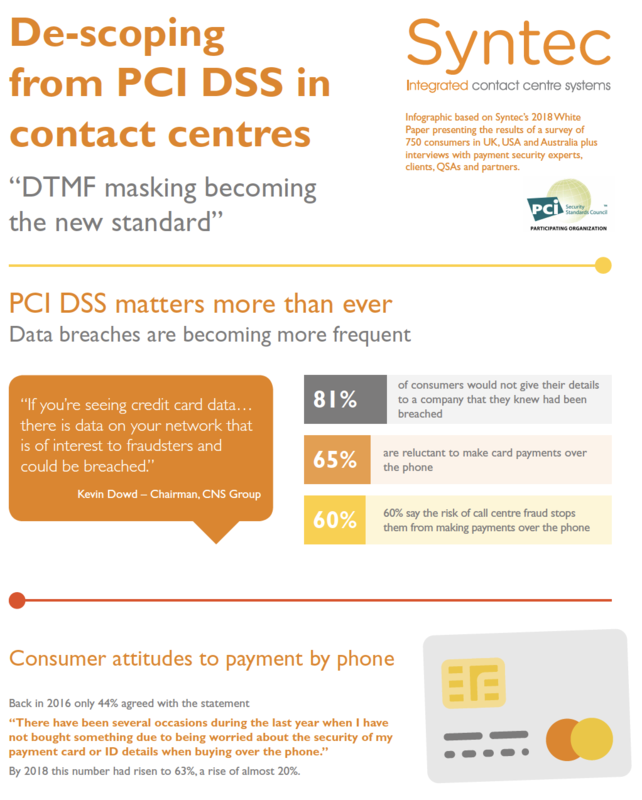 De-scopes the call center from PCI DSS Compliance. Increased customer security and satisfaction. Easy to use for agents and customers. The platform was easy to scale to other areas of the business. The CardEasy implementation was customised to meet the specific needs of AIB. CardEasy provides agents with the ability to identify if the card is a credit or debit and make a decision to progress or not based on the procedures in place. The driver for CardEasy was that we wanted a solution that increased security whilst decreasing the compliance aspect for us – mainly PCI DSS compliance. 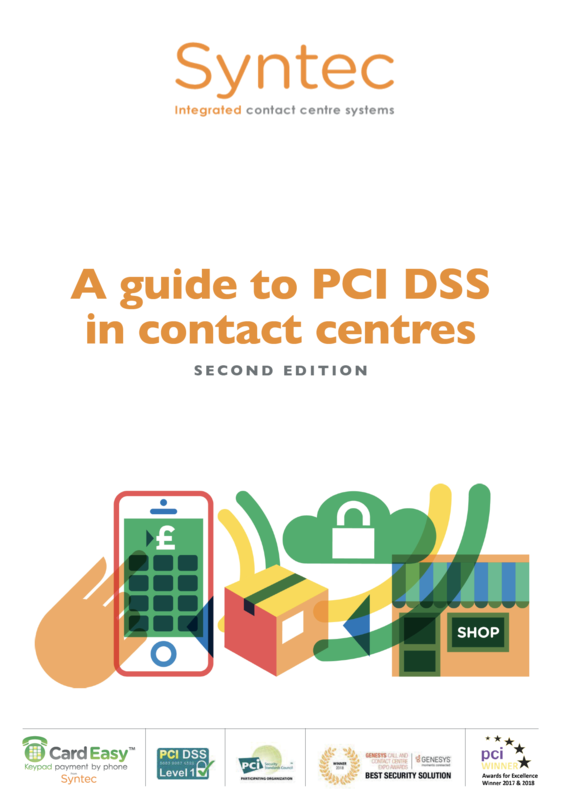 The CardEasy solution is now being extended to other teams at AIB as it very easily de-scopes us from PCI DSS compliance and mitigates the risk of any internal fraud happening. 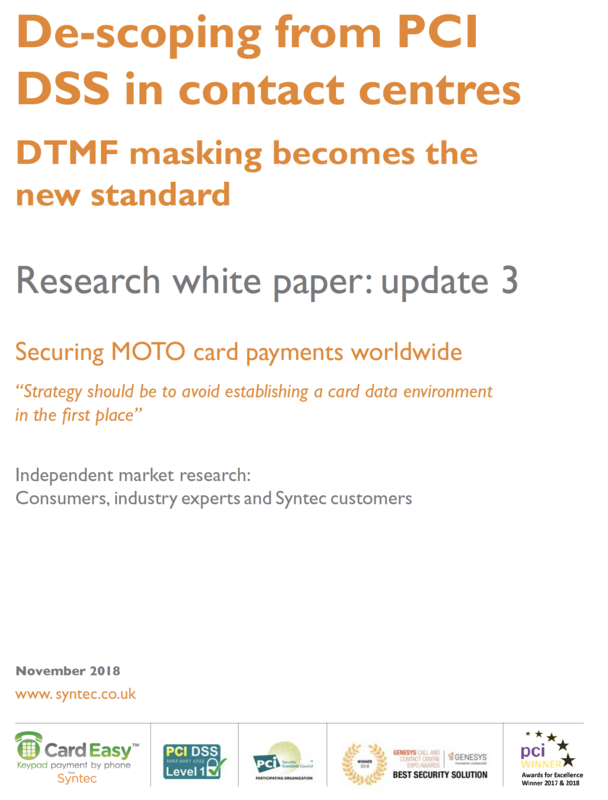 The platform is scalable and easy to use and this is a key driver in our decision to expand, along with the confidence we have in Syntec who have been instrumental in a smooth implementation guiding us and offering insight into the design of our internal call flows helping us address teething issues we encountered. 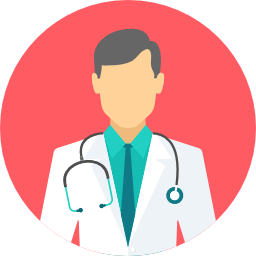 We got great support from Syntec who helped customize the solution as needed and provided excellent support in the launch and expansion of the solution. 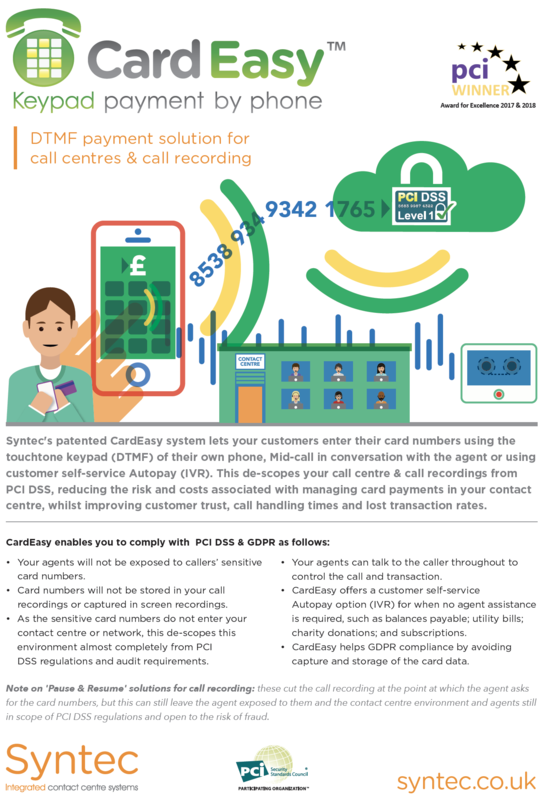 The CardEasy solution – being in call – has enabled us to manage PCI compliance without the need for us to transfer a call to an IVR. This is key for us in terms of engaging with the customer on the phone and building rapport, without transferring the call to an automated system where we are not on the end of the line in support. Once the agents were used to the change, they too have seen this as favourable. Its ability to flag to us whether a customer is using a credit or debit card, before we authorize a payment, has also made it far easier for our agents to stay compliant and avoid taking payments by Credit Card, which has helped them stay compliant and made calls easier to handle.